One of my favorite trends for Summer are tribal prints. On tanks, dresses, and skirts, the look is fresh and somewhat unexpected. The print is a great way to turn a casual ensemble into something that is a little more eye catching. I've seen it offered at several stores and at different price points, making this a really easy trend to emmulate no matter what your budget is. And of course, I always recommend some colorful stone or even feather jewelry for the perfect Summer look. I own this tank and have worn it to death already! My tribal print tank is from Anthropologie, purchased and loved from last year. Do you love tribal prints as much as I do? I am loving the tribal theme as well! Those two dresses are so pretty and I love your blue top with the turquoise necklace...perfection! Natasha and Lilly: thank you! These are all wonderful! I definitely want a few tribal prints this year. I love yours Noelle, great outfit! 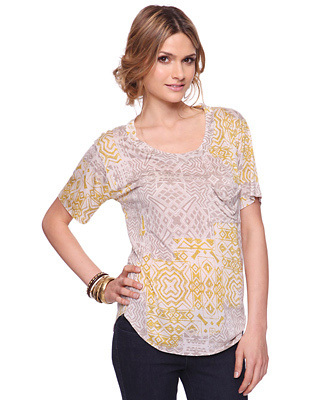 I am digging tribal and Ikat prints lately too. Just another shopoholic: I hope you find some you like! Lidiya: Thank you! I'm completely obsessed with my necklace and have been wearing it non stop! the tribal theme is great right now with the weather, love what you got on, the top really goes with the white blazer! omgosh i love your version of tribal prints the best!! the turquoise statement necklace against the bright blue w/ a white blazer = perfection!!!! Pop Champagne: Thank you sweetie, that little white blazer/jacket was only 16 dollars at Nordstrom Rack! I got another one in a gray color too and they are great to throw on over everything. That happens to me too, I find something nice online but can't find it when I go to Banana Republic. Sad.